Welcome to our website! We hope that you will find many interesting things that will interest you. 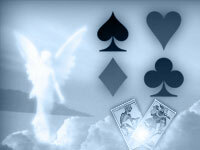 We created a special website, where you will find unique card reading from a deck of Angel Cards. We are the authors of these cards. You can also perform the card reading with the use of a popular deck of Tarot Cards. Additionally, our website has to offer unique horoscopes describing the signs of the zodiac and their love, financial and professional predispositions. In addition, you can check a horoscope on the basis of angel cards. Moreover, we created a unique daily horoscope, which is based on the human biological rhythm that is created on the basis of your date of birth. We hope that you will enjoy our website! The possibility of unlocking the mystery of our fate allows us to avoid unpleasant situations and prevent tragedies from occurring. Probably, many people wonder if we are really able to discover the future and find out what we will face along the path of our lives. Is it really possible? Often the key to knowing our future fate is divination. Divination is quite an interesting practice. Its origins are many thousands of years ago – and was sometimes successful, sometimes not. It can show us the outline of our past, present and future, and help us to understand ourselves better. The form of divination that is available on our website cannot tell you exactly what lies ahead of you. Instead, it will enable you to form an image of the events that await you in the future. It will also provide good insight into your current situation, helping you to understand current patterns of behavior, and warn you against a variety of dangers. It can be used by both women and men. Without the help of fairies, and without any fees, you can independently find out about your future. It is quite rare to perform divination using a deck of angelic cards. Our service uses our exclusive deck – the only deck of its kind on the internet – where each card contains a kind and motivating message. The cards allow you to obtain positive and optimistic advice from personal tutors, so that you can understand almost every problem. They add comfort and hope, showing the way out of unpleasant situations. Certainly, one of the greatest advantages of these cards is the fact that they are a free tool, with the help of which you get interpretations just as if you had visited a fortune teller, and the descriptions from the cards are very detailed. It may sound surprising, but divination is not used exclusively by women and some types of men (usually elderly men who just need help keeping out of trouble). Users of this practice include businessmen, politicians and people high up in social hierarchy. Typically, the most popular methods of divination are fortune-telling tarot cards (which include the Major and Minor Arcana). Their versatility and universal application means that you can read from them a message for almost every problem, in both older and more modern areas of life. If you are using tarot cards on the internet you have to remember that they are not recommended to be used by minors because some interpretations can be difficult to understand, and using these cards requires considerable experience. Remember, however, that no form of divination provides a full prophecy for the future, and its interpretation is not any judgment for you. It shows only a proposal or suggestion which may help you – it will not solve the problem for you. Each of us is responsible for our own life, because your future depends only on you.